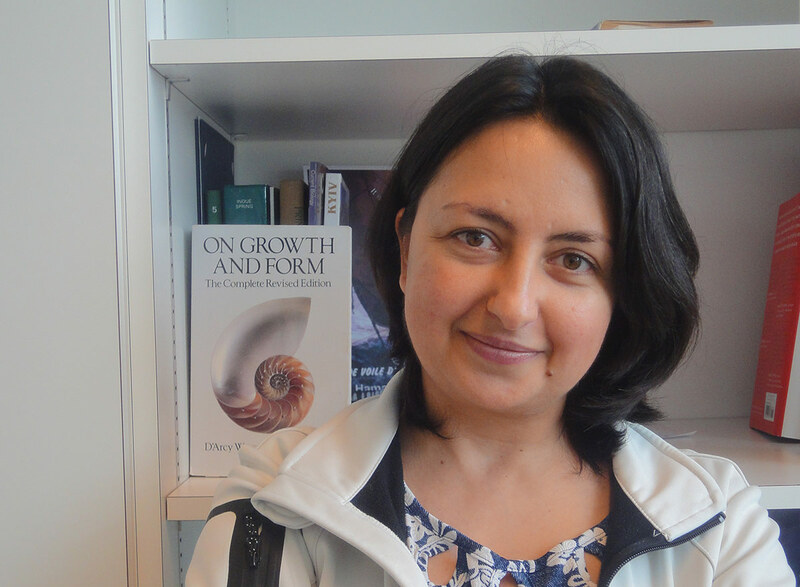 Prof. Hamaratoglu and her team are using the wonderful tools of Drosophila genetics in trying to steal from Nature one of its preciously guarded secrets: “How does an organ “know” when to stop growing after reaching a pre-programmed size?” Given the fact that multiple biological processes are involved – cell division and proliferation, differentiation, tissue movements and programmed cell death –, the question as to which regulatory mechanisms are at play and how they are interconnected goes at the heart of understanding the principles that control growth and shape of a biological body. – Prof. Hamaratoglu, what kind of research is being done in your lab? FH: We work towards understanding how organ size is regulated in animals. This includes characterizing the molecules and the signaling pathways involved, and elucidating the mechanisms at play. Our aim is to grasp the principles by which such complex interplay of different processes – there must be intercellular cross-talk at different levels to regulate fundamental processes, like growth, proliferation, apoptosis… – are coordinated. – And which is your experimental set-up? FH: We are using Drosophila as a model system, studying development of the wing imaginal disc: essentially a single layered epithelium with few different cell types. Its growth and patterning in the larva are completed within as little as 5 days. Following pupation, the wing disc everts and elongates, giving rise to the wing in the adult fly. We modulate particular processes – interfering with a signaling pathway, for example – through the induction of mosaic clones in the wing disc and closely analyze the phenotypes at the cellular and molecular level. – Prof. Hamaratoglu, you are interested in Hippo signaling in Drosophila? – Since then, Hippo signaling has come into the center of attention of developmental biologists, a position which it has managed to occupy ever since. FH: And not without reason: the Hippo signaling pathway is highly conserved and plays a key role in controlling organ size in animals, through the regulation of basic biological processes, such as proliferation and apoptosis. Loss-of-function mutations in hippo lead to dramatic overgrowth of tissues. Due to space restraints, the extra epithelial tissue folds onto itself, looking like the skin of a hippopotamus, hence the name. In addition to its classical role in growth control, Hippo has been implicated in sensing mechanical forces and limiting stem cell proliferation in multiple tissues, adding to the excitement. – Could you comment on some of your recent research projects? FH: We have recently uncovered an unexpected interaction between Hippo and Ras in growth control. Ras is a small GTPase involved in cellular signal transduction and is also evolutionary conserved. Our results show that activation of Ras signaling in cells where Hippo activity is compromised leads to hyper-proliferation of these cells, resulting in dramatic overgrowth. Using genomics and computational approaches, we revealed the underlying molecular mechanisms. The interaction between the two signaling pathways happens at the transcriptional level: Hippo restricts Ras activation by directly controlling the levels of two Ras pathway transcription factors, Capicua and Pointed. FH: Capicua is a transcriptional repressor, and acts through a mechanism termed “default repression”, where the protein is bound to target gene enhancers and inhibits transcription in the absence of a signal. When Capicua is functionally inactivated in our imaginal wing disc model system, only weak phenotypes are observed, because transcription of downstream genes is not activated solely by removing the Capicua repressor. However, when Capicua is inactivated in a loss-of-function hippo mutant background, Capicua target genes are now transcriptionally activated in large domains – resulting in strong overgrowth phenotypes. – What do you observe? FH: The mutant wing discs contain dramatically enhanced cell numbers, beyond the hippo mutant phenotype. – But the mutant cells themselves are not bigger? FH: No, overall the cells are of a normal size. You just have many more of them. FH: In search for answers that could explain these grotesque phenotypes, we performed transcriptome profiling in hippo mutant discs and identified hundreds of genes that are differentially expressed between giant versus normal wing disc cells. Reassuringly, we picked up all Hippo target genes that were already known. Surprisingly though, more than 60 % of the genes that are up-regulated in hippo mutant cells have an unknown function; making it clear to us how little we know about the target genes of the Hippo pathway, their respective functions and how they interact. – How do you plan to tackle this challenge? FH: Through RNA interference, we functionally knocked-down the hundred most up-regulated genes in a loss-of-function hippo mutant background and screened for wing size and wing patterning defects. – What did you observe? FH: About half the cases resulted in smaller wings, ranging from mild to severe phenotypes. So, we have identified 50 genes, most of them with a previously unknown function, which are involved in organ size control. FH: One of the genes we are focusing on at present is Ferritin 1 Heavy Chain Homologue (Fer1HCH), a modulator of iron metabolism. Functionally inactivating Fer1HCH results in wings with a dramatically reduced size. On the other hand, when inactivating the Ferritin 2 Light Chain homologue (Fer2LCH) – which forms the ferritin complex with Fer1HCH – we also observed wing growth phenotypes, although much weaker than with the Fer1HCH RNAi line. Such a link between the Hippo pathway, iron metabolism and organ size control has not been reported previously. – Could it be that the explanation is simple: a cell needs iron to grow? FH: That might indeed be the explanation or part of the explanation. On the other hand, when Fer1HCH and Fer2LCH are concomitantly over-expressed, we observe tumor-like growth of the wing disc. This phenotype suggests that the growth effects we observe might be something different than a general iron metabolism controlled-process: by just making a cell sick, you do not obtain tumorous overgrowth. At present, we are investigating how changes in iron levels influence growth and whether other growth control pathways also influence iron metabolism. In this respect, it’s interesting to note that a recent study has linked iron metabolism with JAK/STAT signaling and tumorigenesis. – When you study the regulation of cell proliferation and organ growth, cancer is never “far away” so to speak. Would you say that your research work could have a clinical impact? FH: Yes, I do believe so. Cancer arises from a single cell that accumulates multiple mutations, leading to uncontrolled proliferation. We can phenocopy this process in the imaginal disc by mutating several genes in a single cell, because we have such nice tools in Drosophila. In this respect, it has been clearly shown that hyper-active Ras can cause cancer; the 3 human Ras genes are the most common oncogenes and mutations that permanently activate Ras are found in no less than 25% of all human tumors. For this reason, Ras inhibitors have come into clinical focus as therapeutic targets to treat certain types of cancer. Now, our results demonstrate that the tumor-growth phenotype resulting from Ras over-activation is strongly enhanced in a loss-of-function hippo mutant background – these tumors are more aggressive. Consequently, screening for mutations in the Hippo pathway will be relevant in certain cases and focusing on Ras as the only therapeutic target might not always result in optimal clinical benefit.